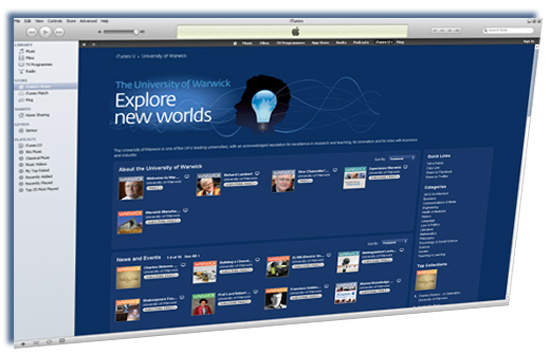 Welcome to the University of Warwick on iTunes U. This free service allows you to access interviews with academics, programmes about research at the University, lectures, teaching materials and content from our student community. To access iTunes U you will need a copy of iTunes installed on your computer. You can download iTunes from the Apple web site. Read more information about accessing iTunesU in our FAQs. If you do not use iTunes you can access Warwick content through the Podcast Browser on the University web site. If you are a member of staff or a student at the University of Warwick and wish to discuss how you can contribute a podcast or video from your department then please contact itunesu at warwick dot ac dot uk. Whilst we would encourage you to produce your own materials, support is available through the eLearning team and Communications Office to help you create content and develop your production skills. If your ideas are more ambitious, or you have an especially high profile story or event, the Warwick Digital Press will be able to work with you to make sure you get the most from your recording. Any podcast made available through the iTunes portal for the University of Warwick has to be reviewed to make sure that it meets our legal requirements in regards to copyright, IP and other areas. If you need advice in this regard please contact itunesu at warwick dot ac dot uk. During the bicentenarial year of the birth of Charles Dickens (7th February 1812), the University of Warwick is celebrating the life and works of one of the greatest authors to ever put pen to paper. Experts from the University and beyond explore the genius of Dickens across different aspects of his experiences, knowledge, philanthropy, character-rich novels and the Victorian era, in which he lived. Video and audio interviews with leading academics plus readings of extracts of his work pay homage to the way the great man has stood the test of time and continue to have a huge influence on today’s authors, filmmakers, artists and academics. Prof Lord Robert Skidelsky - How Much is Enough?